Well, no-where. Not any more. Another one of those ex-motorways then? OK, where was it then? When did it cease to be a motorway? It's not one any more! OK, by definition that's pathetic. What was it like as a motorway? It was all of 2 miles (just over 3km) long. And it was all stuck alone in seemingly the middle of no-where, as the Tring By-pass. Hmm, a motorway connected to no other. Was that all? No. 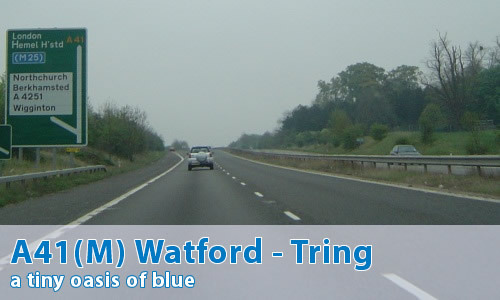 The A41(M) is grandly titled "The Watford - Tring Motorway" in a set of 1970s motorway strip maps in my possession. It never got beyond being "The One Side of Tring - The Other Side of Tring Motorway", although it was meant to follow the line of what is now the upgraded A41 to the present M25, and then beyond to the original northern end of the M25 at J19a, Hunton Bridge as can be seen here. In addition, the A41(M) was then due to continue over the top of Hunton Bridge Roundabout, and then would have ended in the area of Berrygrove, or M1 junction 5 to most people! It then got downgraded in 1987. A copy of some relevant documentation can be found here. And it's absolutely nothing to do with the M41. Not at all. Not ever. No matter what you might read elsewhere - the two roads only have the number "41" and the fact that they are in South East England in common. And the A41(M) was never meant to go to Birmingham either - that's an urban myth based on utter speculation. There is no evidence of the motorway being extended north of Tring - and indeed it crashed into a roundabout at that end. More than most people ever got to with this motorway! Not quite. In a twist of fate, the remainder of the A41(M) has actually been completed, just downgraded in standard to the present A41 between Tring and the M25. The junctions aren't up to scratch, but the road exists! Can I see some photographs then?? Comments prior to September 2007 can be found in the relevant archive. I'd like to add some useless trivia about the usefulness or not-so-usefulness of this stretch of road when it was the original 'Tring bypass'. By local hearsay, the road did have a purpose:- Noel Edmonds allegedly used to take his GT40 for shakedown runs on the stretch of road in the small hours. There is the usual story of being stopped by the boys in blue but being let off for novelty value, and being told to watch how he went ! Here's another bit of trivia I picked up, having lived in Berkhamsted (next town along) for nearly 20 years. Berkhamsted has a very large police station, for the size of the town. It was built to be able to cater for the Traffic Units needed for the completed Tring to Watford Motorway.